Note: Things have moved on since this question was asked; see here for a good recent overview. Before auto layout, you could change the anchor point of a view's layer without moving the view by storing the frame, setting the anchor point, and restoring the frame. In an auto layout world, we don't set frames any more, but constraints don't seem up to the task of adjusting the position of a view back to where we want it to. You can hack the constraints to reposition your view, but on rotation or other resizing events, these become invalid again. My intention here was to set the left edge of layerView, the view with the adjusted anchor point, to half of its width plus 20 (the distance I want inset from the left edge of the superview). Is it possible to change the anchor point, without changing the location of a view, in a view that is laid out with auto layout? Do I need to use hardcoded values and edit the constraint on every rotation? I do hope not. I need to change the anchor point so that when I apply a transform to the view, I get the correct visual effect. Autolayout does not play at all well with view transforms. The reason, as far as I can discern, is that you're not supposed to mess with the frame of a view that has a transform (other than the default identity transform) - but that is exactly what autolayout does. The way autolayout works is that in layoutSubviews the runtime comes dashing through all the constraints and setting the frames of all the views accordingly. In other words, the constraints are not magic; they are just a to-do list. layoutSubviews is where the to-do list gets done. And it does it by setting frames. I expect to see the view appear with its center in the same place as before and at half the size. But depending on its constraints, that may not be what I see at all. The upshot is that if you have no constraints that affect a view's frame, autolayout won't touch the view's frame - which is just what you're after when a transform is involved. The problem with both the above solutions is that we lose the benefits of constraints to position our view. So here's a solution that solves that. Start with an invisible view whose job is solely to act as a host, and use constraints to position it. Inside that, put the real view as a subview. Use constraints to position the subview within the host view, but limit those constraints to constraints that won't fight back when we apply a transform. And meanwhile the constraints on the host view keep it in the right place as we rotate the device. Instead of view transforms, use layer transforms, which do not trigger layout and thus do not cause immediate conflict with constraints. As you can see, it grabs the center point of the View when first called and reuses that Position in further calls in order to place the View accordingly. This overwrites the Autolayout Code in that sense, that it takes place after [super layoutSubviews]; which contains autolayout Code. Like that there is no longer any need to avoid Autolayout, but you can create your own autolayout when default Behaviours are no longer appropriate. Of course you can apply way more complicated stuff than what is in that Example but this was all I needed since my App can only use Portrait Mode. I find a simple way. And it works on iOS 8 and iOS 9. When you adjust view's anchor with auto layout, you do the same thing but in constraints way. When anchorPoint change from (0.5, 0.5) to (1, 0.5), the layerView will move left with a distance by half the length of view width, so you need to compensate for this. If you're using auto layout, then I don't see how manually setting position will serve in the long run because eventually auto layout will clobber the position value you've set when it calculates its own layout. Rather, what's needed is to modify the layout constraints themselves to compensate for the changes produced by setting the anchorPoint. The following function does that for untransformed views. Set the anchorPoint of view without changing is perceived position. I admit this is probably not everything you were hoping for, since usually the only reason you'd want to modify the anchorPoint is to set a transform. That would require a more complex function that updates the layout constraints to reflect all the frame changes that could be caused by the transform property itself. This is tricky because transforms can do a lot to the frame. A scaling or rotation transform would make the frame bigger, so we'd need to update any width or height constraints, etc.. If you're only using the transform for a temporary animation, then what's above may suffice since I don't believe auto layout will prevent the in-flight animation from presenting images that represent purely transient violations of the constraints. tl:dr: You can create an outlet for one of the constraints so that it can be removed and added back again. I created a new project and added a view with a fixed size in the center. The constraints are shown in the image below. Next I added an outlet for the view that is going to rotate and for the center x alignment constraint. Then I remove the constraint that I have an outlet for, create a new one that is offset and add it back again. After that I tell the view with the changed constraint that it needs to update the constraints. 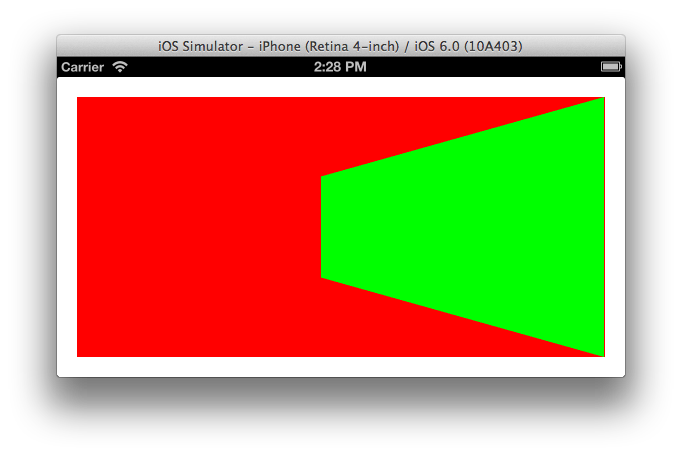 Finally I just add the rotation animation to the rotating view. The rotating layer looks like it stays centered (which it should) even when rotating the device or otherwise causing it to update the constraints. The new constraint and the changed anchor point visually cancel each other out. My current solution is to manually adjust the layer's position in viewDidLayoutSubviews. This code could also be used in layoutSubviews for a view subclass, but in my case my view is a top-level view inside a view controller, so this meant I didn't have to make a UIView subclass. It seems like too much effort so other answers are most welcome. // Assuming a transform is in use since we are changing the anchor point. Inspired my matt's answer, I decided to try a different approach. A container view, with constraints applied appropriately, can be used. The view with the modified anchor point can then be placed within the container view, using autoresizing masks and explicit frame setting just like in the bad old days. It doesn't matter that the frames for the red view are zero at this point, because of the autoresizing mask on the green view. I think you are defeating the purpose of autolayout with that method. You did mention that the width and right edge depends on the superview, so why not just add constraints along that line of thinking? The NSLayoutAttributeRight constraint means exactly like anchorPoint = CGPointMake(1.0, 0.5), and the NSLayoutAttributeWidth constraint is roughly equivalent to your previous code's NSLayoutAttributeLeft. 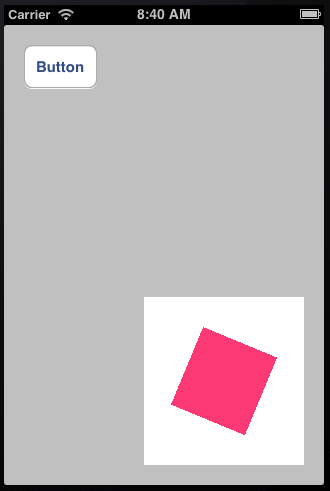 This is an example of an UIScrollView with custom paging completely made in AutoLayout and is scalable (CATransform3DMakeScale) with long press and tap to zoom. iOS 6 and 7 compatible. It is a big topic and I have not read all of the comments but was facing the same issue. 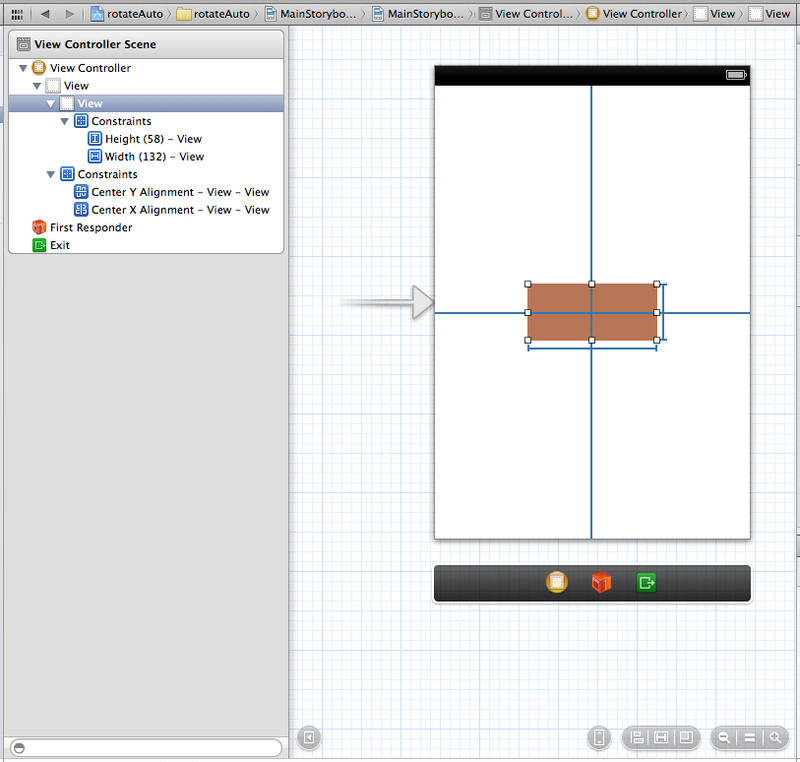 I had a view from XIB with autolayout. And I wanted to update its transform property. Embedding the view into a container view does not solve my problem because the autolayout was acting weirdly on the container view. That's why I just added second container view to contain the container view that contains my view and was applying transformations on it. tl;dr Let's say you changed the anchor point to (0, 0). The anchor point is now top left. Anytime you see the word center in auto layout, you should think top-left. When you adjust your anchorPoint, you just change the semantics of AutoLayout. Auto layout will not interfere with your anchorPoint nor vice versa. If you don't understand this, you're going to have a bad time. Figure A and Figure B look exactly the same. Nothing changed. Just the definition of what center refers to changed. Not the answer you're looking for? Browse other questions tagged ios calayer autolayout or ask your own question. How to make flip animations from one UIView to another when using Auto Layout? Are rotated Views compatible with Auto Layout?